I'm so happy that I decided to do this. Ever since having Emerson I was stuck at a weight. I gained 39 pounds with him. I started at 130 and was 169 the day before I delivered. At 2 weeks post partum I was down to 145ish so that was FANTASTIC! However, I was still stuck there as of 6 weeks ago. My online due date group decided to put together this weight loss challenge, we each put in $10 into the pot and the person at the end of 8 weeks who loses the most percentage will win the money! I'm so glad I decided to join because I feel amazing!! So what have I done in 6 weeks? I haven't exercised much that's for sure. I haven't had time and with school starting life was hectic. Now that Avery is in school and I have a jogging stroller I'll be going on jogs in the morning with Emerson. I have changed my proportions a LOT. I have cut back a ton, but I'm not really watching what I eat much. I eat a fiber one bar for breakfast every morning, that's it and it usually holds me over until 12 or 1. Then I'll usually jut grab like a sandwich for lunch or 1 pack of ramen noodles and then dinner is a usual dinner that I make, but it's smaller portions. For snacks I'll grab some fruit or veggies. You need to eat every 4 hours to keep your metabolism up, so keep that in mind. Eating more often helps you lose more weight. That's it. It has been nothing special, but I have learned that cutting back on proportions makes the world of difference. So how have I done?? I have also lost 10". 1" from my waist, 3" from my belly button, 2" from my hips and 2" from each thigh! I feel AMAZING and more energized. 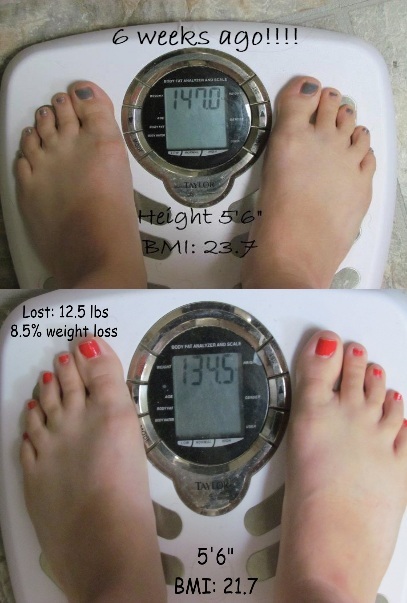 It's amazing what a little weight can do. I'm happy where I am. I was wanting to fit into three quarters of my jeans by fall and I've done it. I had to buy size 6 shorts for the summer because none of mine fit me, but I just bought myself a new pair of size 4 jeans and they fit me like a glove. I also wore a pair of capris last week that didn't fit me a few weeks prior. I'm so happy to be losing this weight. I would like to get down to 130 where I as when I got pregnant with Emerson. But to say I've lost 12 pounds right now is AMAZING to me!!! Wow, you have done fantastic. It is such hard work to lose weight, 12 pounds in 6 weeks is just awesome. ditto, Diana. I initially lost a lot of weight due to on demand breastfeeding and not enough calories, then I started bad eating habits....and now 3 years later I am rounder than I have ever been. I have yet to find the motivation. It's fun to see the ways that people find motivation to accomplish their goals. I was feeling like giving up when I decided to ask my Facebook and blog fans to help. Knowing there are people seeing my progress has been motivating. Continued success to you and good luck winning!